Here are a few inspiring quotes to help you hit that bull's eye. Remember that the higher you aim in life; the more you will achieve. Learn from your mistakes --even better learn from the mistakes other have made-- and keep moving towards your goal. Yes you will encounter setbacks, but that is where your true character will come into play. Dust yourself off -- and keep going. 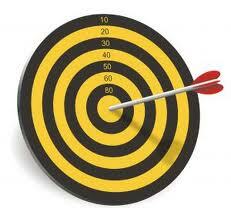 Many people feel they have not reached their potential -- perhaps they have never set their sights on a target. In order to reach your goal --- you first have to set one. Bear in mind that these inspiring quotes are only one of the tools available to you. The driving desire to succeed must be planted in your mind & heart -- and cultivated on a daily basis. What you feed your mind is just as important what you feed your body. 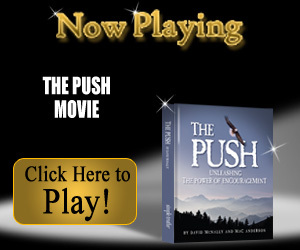 -- with inspiring quotes, motivating books, encouraging friends and empowering websites. "First ask yourself: What is the worst that can happen? Then proceed to improve on the worst." ”When you are looking for obstacles, you can't find opportunities." they find their way more surely than those who see but have not faith or purpose." but often we look so long at the closed door that we do not see the one that has been opened for us." only empty heads and hearts can do that." "Do not wait; the time will never be "just right". If you disregard this advice, you'll be halfway there." what we contribute...that gives meaning to our lives." but by what you finally accomplish." "I hated every minute of training, but I said, "Don't quit. "Cherish your wishes and your dreams, as they are the children of your soul and the blueprints of your ultimate achievement...."
I hope that these inspiring quotes provide that "extra little push" that you need. "It does not matter how slowly you go, so long as you do not stop"
"The only thing in life achieved without effort is failure...."
"The few who do are the envy of the many who only watch. " I hope that you have found our inspiring quotes helpful. Please share them with your friends & families. As always we want to hear what you think & your suggestions.